Ewafe Project Update – Exciting news! We are half way through building our Ewafe project home, and pleased to say that this building project is going well. It is amazing to think that just 6 months ago the site was just a bare piece of scrub land, and now we have a building with foundations and walls! This home will house children who have been abandoned and urgently need a place to stay while we either trace their families or look for suitable foster families to place them in. Since launching this project in June 2013, we have been overwhelmed with the generous support we have receieved from so many people, and we would like to say a huge thank you to everyone who has donated and fundraised for this project so far. For more information about the Ewafe project, view our Ewafe project video and if you are interested in donating towards this, please click here. 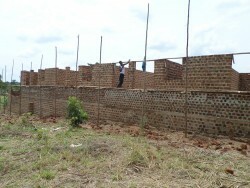 Following completing the walls, our next fundraising step is to raise the money to put a roof on the building. And we are very excited to announce that on Saturday 3rd May, a special fundraising concert is taking place in London specifically for this! The ‘Raising the Roof’ concert is hosted by Michael Kiwanuka, and Marcus Foster, Beth Rowley, Stokes William and CJ & the Birds are also performing. Tickets are £25 and can be purchased here. For more information about the gig, check out the facebook event too. Please come along, spread the word and invite your friends! We hope it will be a great success and make a big difference in the lives of many abandoned children in Kampala.